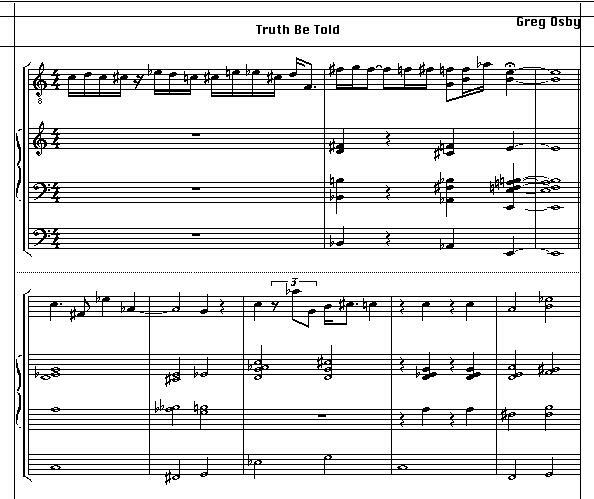 This is a lead sheet style chart of a composition entitled "Truth Be Told". It is featured on the CD Greg Osby and Joe Lovano- Friendly Fire (BN# 7243 4 93760 2 1) This piece was written specifically for this session with Joe in mind as he is one of the most genuine and honest persons/artists that I have ever known. 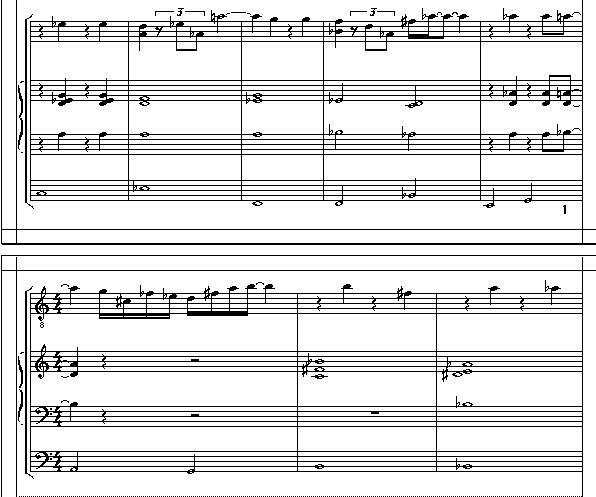 The most dominant rhythmic element in this piece is the usage of the rests on the first and third beats in many of the primary melody statements. This promotes a dominant "hesitation" effect to the phrases and give the passages a built-in instability, which can be quite effective if utilized sparingly. Any motive or device can quickly become burdensome if it is made to be the focus of a work as opposed to being merely a support element. The bass voice has a different function than what is considered usual or "normal" in comtemporary improvisational composition. In this instance, there is practically a figured bass patterning which, in fact, makes the bass the most prominent element which defines the overall character or mood of the piece. The bass motion is primarily whole and half note strikes as opposed to the typical walking patternization of movement. This practice gives the piece a lumbering, sloth-like feel. It reminds me of a dream where I'm being chased by a giant who is moving in slow motion. I have had this reoccuring dream since I was a child and the image somehow found it's way as the focus idea for this piece. Special attention should be given to Joe Lovano's call and response entrance to his saxophone solo. His opening statement (bars 1&2) is a masterful "take charge" type lead in. Many players will often slowly build their solo, reaching a peak after several choruses have cycled. In this instance, Joe opted to burn from the very beginning. 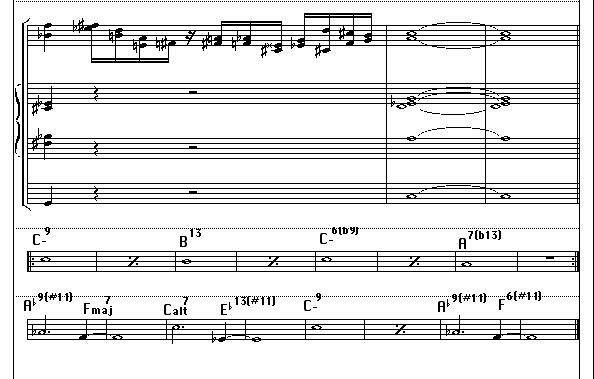 The second phrase (bars 3&4) is a direct answer to the first passage and has a similar rhythmic motion - a perfect textbook entrance which firmly establishes the topic and "vibe" of his improvisation. This approach secures for Joe a solid platform for logical and inspired improvising. Many solos never get off the ground simply because the entrance was too unstable and not melodically profound. In other words, one cannot build a foundation for a house unless the concrete is solid - otherwise the house will crumble.